Looking for a CRM Software that links / integrates with Campaign Monitor? Then you’ve found it. 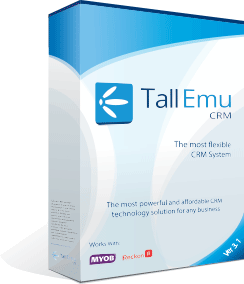 Combine the power of Tall Emu CRM and campaign monitor to develop, deliver and track beautiful targeted email campaigns with the results updated automatically in Tall Emu CRM. Linking directly with Tall Emu CRM, you can now specify your targets based on any of the CRM data, upload the target list to Campaign Monitor and run your campaign. This is extremely useful if you are on an unreliable connection, do not have a powerful or “always on” server. For the bulk sending of campaigns, using Campaign Monitor’s enterprise-grade infrastructure is far better than trying to use your own mail server (or your ISP mail server) as you won’t be throttled. Once the campaign has been sent, results are automatically available online in the Campaign Monitor user interface but also within Tall Emu CRM. This means that you retain your ability to see all of the communications with your customers from within the familiar Tall Emu CRM interface. Existing Tall Emu customer ? Please contact Tall Emu support to get your hosted e-Marketing account set up. This requires version 3.0 or higher of Tall Emu CRM.